While spring brings welcome rain and flowers blooming, it also brings bugs. Lots of them. Wool moths, Tineola Bisselliella and carpet beetles, Anthrenus Verbasci. If any creatures on the planet can be called the enemy of oriental rugs, it’s these little buggers. These pesky intruders literally eat through the wool of your rug, causing damage quickly and quietly. Too frequently, beautiful hand woven Persian or Navajo rugs come to Serafian’s for cleaning only to find the rugs have been destroyed by moths or carpet beetles. Worse yet, they often move swiftly, leaving a trail of damage in their wake. The damage in this rug occurred in about 1 to 2 weeks time. The lifespan of the average carpet moth is very short, the larvae phase lasts on average about two weeks to a month, and the adult phase about another month. Only the larvae eat wool, so while you are more likely to see the adults fluttering through your home, it’s the larvae that do the real damage. Unfortunately, this means that a rug can go from undamaged to having a huge hole in just a couple of weeks. Carpet beetles, however, do damage over more time, with a much longer lifespan and some subspecies living as long as three years. Unlike their moth counterparts, carpet beetles will eat at your rug for their entire life. In either case, quick identification, elimination, and prevention are the keys to keeping your rugs safe. How do you identify them? For wool moths, keep an eye out for the adults flitting around your home or the eggs laid on the surface or on the back of your rugs. The large moths that we see every year here in the early months of summer are no threat to your rugs. Adult wool moths are small, about the size of a grain of rice. They are tan in color with no particular design or pattern on their wings. The eggs look like grains of sand held together by spider webs. The eggs themselves are tiny, about the size of a grain of sand. The silky webbing from the parents hold the eggs in place. 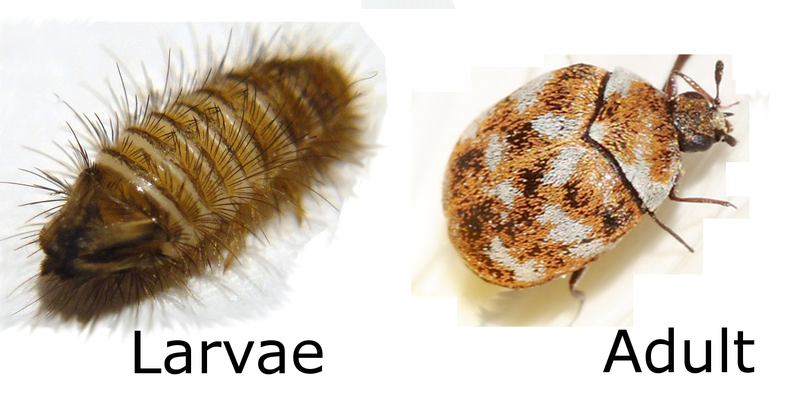 Carpet beetles are tiny, about the size of a pinhead. You can identify them by finding either the beetles themselves or by finding small black or brown husks or shells. In both cases, the insects like to attack dark and undisturbed areas on your rugs. So look for them under your furniture, rolled up in your closets, and on the backside of any rugs hanging on the walls. These critters are pretty tiny. – Pictured above, the larval forms of each. Elimination is a little trickier. You need to not only eliminate the moths, beetles, and eggs on the rug itself, but also any that might be in the surrounding area. Most insecticides are effective at killing any living infestation, but unfortunately not that great at killing off the eggs. Also, any use of insecticides in the home comes with risk to one’s own health and safety. Instead, we recommend you have your rugs professionally washed by a cleaner who knows how to eliminate these infestations. Proper temperature control and handling will eliminate any eggs that have been laid into the foundation of your favorite carpet. As for your home, thorough cleaning of any area exposed to infestation is very important as the eggs can slips into the cracks of your wood floor or down into your wall-to-wall carpet. As with your rugs, we recommend utilizing professional cleaners. If after taking these steps, the moths or beetles persist, it’s time to get in touch with an exterminator. As with most things, an ounce of prevention is worth a pound of cure. Various sprays can help to repel moth infestation, regular inspection goes a long way to identifying a problem before it spirals out of control, and proper wrapping and storage of unused rugs can easily prevent infestation. Always remember that if you take a little time to ensure that your rugs stay moth and beetle free, it will ensure your favorite rugs stay beautiful and valuable for many years to come. Why Professionally Clean Your Rugs? It’s easy to tell the difference between a fine Oriental rug and wall-to-wall carpeting. One is an heirloom that will be handed down through the generations, and the other should be replaced after 10 to 15 years of wear and tear. One has designs and patterns stemming from centuries of cultural tradition and love, the other is typically monotone. It may seem obvious, but when it comes to cleaning, one needs careful care and attention, while the other can be quickly steam-cleaned. When it comes to your fine Oriental rugs, steam cleaning is detrimental to the integrity of the rug. Wool contains lanolin, a sheep’s natural oil, which gives the rug its sheen and lustrous appearance. It is also a big part of what creates durability and longevity in the wool fibers. Unfortunately, the heat and detergents used in steam cleaning strips this lanolin out of wool. Very quickly, this will affect both the appearance and durability of your rug. Additionally, it is nearly impossible to completely rinse out the detergents from wool. Unlike nylon, which as a fiber is created to be smooth, wool has a naturally scaly structure. Detergents tend to get trapped in these scales. This compounds with time, as detergent residue attracts even more dirt, causing your fine Oriental rug to become grey and dirty even more quickly than it did before. Controlled, thorough and proper rinsing is the solution to this problem and unfortunately typical wall-to-wall cleaning methods (like the steam cleaners you can rent at the grocery store) just don’t cut it. The only proven effective methods of cleaning Oriental rugs are cold water flood and immersion washing. Both these methods involve the use of cold water, large quantities of it, and carefully controlled methods to ensure dye stability. Additionally, rather than relying on harsh detergents, these methods use gentle shampoos to scrub the dirt from your rugs. The low temperatures help to keep the lanolin in your rug intact, preserving its long-term durability. The moisture penetrates deeper into the fiber helping to remove the deep and ground-in soil. Most importantly, the high volumes of water are the key to removing the excess shampoos ensuring the long-term beauty of your rug. Wall-to-wall carpet is expected to be replaced every decade or so. Yet a good hand woven Oriental rug will last for generations. Where steam cleaning is a fast way to clean the carpet in your home, it’s a sure way to damage your favorite fine rug. Regular and proper cleaning is the most effective way to preserve the beauty and value of your rugs, and professional immersion and cold water washing methods are the only safe and effective way to have this done. We all love our animals. They brighten our days, lift us up when our spirits are down, and make our homes feel complete. Unfortunately, accidents are inevitable, and even the best dogs and cats will occasionally have an accident on your Oriental rugs. Today, we are going to go over a few quick steps you can take to help prevent damage and odor from pet urine. Keep in mind, these steps can be effective at removing urine from your wall to wall carpet as well. You will need- White Vinegar and paper towels or dry rags. 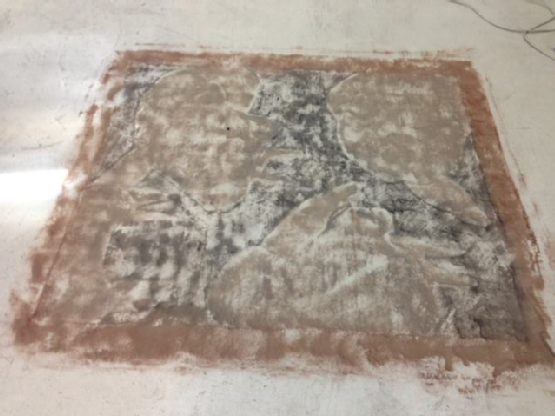 Step 1 – If the spot is still wet, poultice the area. If it is already dry, move on to step 2. The first reaction a lot of folks have is to wipe the area up with a wet rag. A much more effective method is “poulticing”. To poultice a spot, take a dry rag or paper towels and apply downward pressure on it. The moisture will soak into the rag and get sucked out of your rug. A poultice is more effective because it doesn’t spread the spot around and removes a much greater quantity of moisture. It’s important to note, that if you own good wet vacuum that is capable of removing moisture, you can use that instead of poulticing the spot. Step 2 – Apply white vinegar. White vinegar is great for eliminating the odor of most pet urine. It also helps to keep the dye in your rug set, preventing color migration. Pour enough white vinegar directly onto the spotted area to soak it. While the odor of the vinegar is intense, it will fade quickly as the area dries out. Step 3 – Let it sit for 3 to 5 minutes. We call this “dwell time”. The white vinegar will help break down the bonds holding the urine in place. This is especially important if you are dealing with cat urine as it tends to have oils that need to be broken down. Much like step one, use a poultice to remove the white vinegar. Again, if you have a good wet vacuum, you can use it instead. Step 5 – Smell the area, possibly repeat steps 2 through 4. Take a quick sniff of the area, if you can still smell the urine over the vinegar, it means you need to repeat steps 2 through 4. If the white vinegar is the only thing you are smelling, move on to step 6. Step 6 – Dry the area quickly and correctly. Getting your rug dry quickly and effectively is a crucial part of keeping the bacteria in the urine from heavily reproducing. Air flow is key, so using a box fan or desk fan to blow over the wet area will go a long way towards this. If you can expose both the top and bottom of the rug to that air flow, it will speed up the process tremendously. You can prop books up underneath your rug or even drape it over a chair to achieve this. Once dry, you have done all you can to treat the spot. In most cases, you will find that the smell is gone and the staining reduced. It is important to note, that while this helps the appearance and smell of your rug, it does not really disinfect it. If sterilization is what you are after, or if problems still persist, it’s probably time to have your rug washed professionally. Full immersion cleaning is by far the most effective technique for eliminating and disinfecting urine. Even the best trained pet will have occasional accidents, so what can you do to help make sure those accidents don’t soak into your rug? We recommend Fiber ProTector brand stain guard. Built to keep moisture form soaking into the fibers of your rug, Fiber ProTector can keep any accident from becoming a more troublesome spot. Amazing New Fiber Protection Technology! Serafian’s has sold various fiber protection and stain-repellant products over the course of our history. We are extremely pleased and excited to announce that we have finally found a product that not only do we believe in 100%, but completely amazes us in its effectiveness! 547 Fiber ProTector was created by Norweigan scientists and is a hydrophobic polymer spray that is unquestionably the most advanced and effective fiber protection system available. This isn’t Scotch Guard, and it’s not a temporary fail-safe against staining. Fiber ProTector forms an invisible shield around textile fibers providing an effective barrier against all kinds of organic matter such as pet stains, as well as food, drinks, dust and debris that on unprotected tiles would create permanent stains. Our new Fiber ProTector adds UV protection and does not affect the texture of your surfaces or their breathability. This product is used by major hotel chains, railroad trains, and airlines to protect their seating and furniture. Your rug should benefit from our protection! Call us at Serafian’s to have your rugs treated with 547 Fiber ProTector today. Rugs are some of the most durable home furnishings you can purchase. They are woven to be walked on and receive the heaviest traffic and abuse, but still last generations. In fact, rugs have very few “Natural Enemies”. Chief among those diabolical foes are Moths and carpet beetles. places on your rugs. Once the eggs hatch, the larvae begin to quickly eat their way thorough wool, silk, or any other protein fiber. Regular inspection of at risk areas goes a long way to preventing damage and keeping your rugs safe, but if you ever do find evidence of moth eggs, call a rug cleaning professional right away. Less common than the wool moth, but every bit as dangerous to your rug is the carpet beetle. Smaller than Abraham Lincoln’s face on a penny, carpet beetles are tiny, but don’t be fooled by their size. Just like moths, they can lay their eggs in your rugs and chew through your rug in a few days. If you have a pest infestation, be it moth or carpet beetle, always remember to call a professional. Proper cleaning will remove the infestation, kill any eggs hiding in the pile or foundation of the rug, and go a long way toward preventing future damage.